Alright kids, you know what’s coming. It’s the moooost wonderful tiiiime of the year. 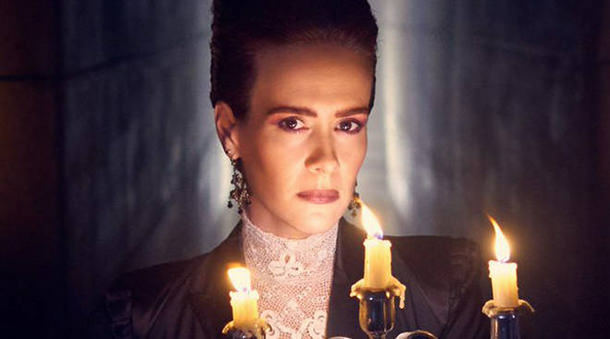 The premiere of a new season of American Horror Story is already like Christmas. Blending Coven with Murder House is like, super Christmas. Or Christmas times Halloween. So far though, we’ve only seen one major thing that connects Apocalypse with any previous season. But let’s not get ahead of ourselves. As always, here there be spoilers. We begin with Evan Peters as a hairdresser to the stars, giving Leslie Grossman a haircut so she can become and Instagram influencer and really make something of herself. (pause for chuckling) These opening scenes where we meet the cast and see the lives they’re leaving behind are chilling, violent, and a little funny in a darkly comedic way. As per usual, they sneak in plenty of social commentary. Sending your DNA to an ancestry website might earn you a place in a safe house when the end of the world comes. You’ll miss your twin though, if you’re less identical than a Weasley. So, who is there? We’ve got Evie Gallant (Joan Collins). She’s a friend of Donald Trump, who hopefully will only get that one mention this season. Her grandson (Evan Peters) who doesn’t have a first name yet. There’s Coco (Grossman) who watched her family die via Facetime, then told her boyfriend (Billy Eichner) that he was free to see other people. Not the best deal when most of the living are soon to be “canker pus monsters.” Coco’s assistant, Mallory, (Billie Lourde) is allowed to come to the safe house and be a “worker ant,” wearing all grey and basically being told to be grateful. Yeah, that always goes well. Serfs hate rising up, right? Coco is whiny and annoying. I was uncomfortable with how satisfying I found seeing her get slapped in the face. We meet Emily (Ash Santos), who we know almost nothing about except that she’s civic minded and has no family to speak of. Timothy (Kyle Allen) is the kid they kidnapped for his awesome DNA. Once we arrive at the safe house, we learn that it’s one of ten outposts around the world. One of the main problems they face is that other outposts keep getting overrun. Well duh. So…is this the end? No. As Wilhemina Venable (a name rife with all sorts of symbolism) tells it, this is a beginning. Kathy Bates returns to play Ms. Miriam Mead—a woman with a strong survival instinct and a penchant for upward mobility. There’s Dinah Stevens (Adina Porter), former TV personality and generally calm and logical person. There’s gay couple Andre and Stu…but before long, there’s just Andre. He’s pretty unhappy about the whole thing, not that I blame him. There’s def chicanery afoot there. The savagery in this episode, coupled with the disregard for network norms is on full display here. We hear the F-word within the first minute of this ep. I don’t mind, but I’m still weirded out by it being heard on commercial television. Gunfire erupting at the airport was unnerving, and the image of being on a plane watching a mushroom cloud bloom and hang in the air—even though we’ve seen that in plenty of movies (and even stock footage) it never ceases to be visually jarring. I’m a little surprised we didn’t see more suicides, but that one body smacking into the car full of passengers was enough to get the point across. Ever since 28 Days Later, the idea of mass suicides is firmly ingrained in any scenario depicting the end of the world. Before long, it seems like everyone is in their places, thanks to The Cooperative. Wilhelmina runs this Outpost, which is #3. She presents herself as the face of The Cooperative, but I get the feeling that she’s exaggerating just a tad. Her right-hand lady appears to be Ms. Mead. There are purples, people who are either really rich or have a mind fine enough to be worth saving for whatever the plan for the new world turns out to be. We learn that there is “no unauthorized copulation” and witness some worker ants being executed for this very thing. Ugly rules in this new world so far—but at the same time, resources are limited and new babies are expensive even when money is useless. Why is everyone dressed in old timey formal wear? Just to romanticize an earlier age? Mention is made that technology and social media are what ruined the world, and possibly the lack of a rigid caste system. But if we look at history, we know that rigid caste systems eventually break down when those on top push those beneath them to the brink—causing an uprising. The only colors anyone wears are purple (known as the color of royalty) and grey (peasant color), plus a few radiation-proof outfits in black or yellow. 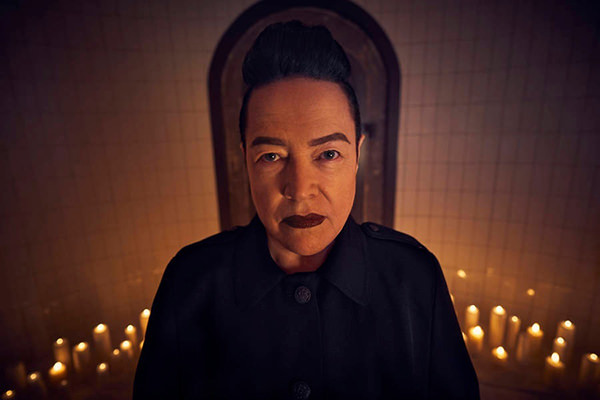 The costumes are fun, the hair is kinda kooky, but like a lot of things on American Horror Story, they seem to be doing it just because they can. The clothing isn’t the only remnant of an earlier time. Watch for carrier pigeons, candlelight, and carriages drawn by horses in plague masks. Dinner is a formal affair. But the food? Not so much. It’s probably not like, Snowpiercer bad, but it ain’t exactly mouthwatering. Food is one of the great pleasures of life. Between that and having one song at a time played on an endless loop (a nod to Asylum perhaps?) is enough to drive great minds insane. Speaking of the songs, it was cool to hear the Carpenters and their song about Interplanetary travelers. But when they brought out the “You Belong to Me” song from Murder House, I squeed with glee. They don’t always eat cubes though. One night there’s a stew made of “chicken.” Of course, it’s not chicken. As Andre screams in horror: The stew is STU! Poor Stu. Stu was set up as contaminated and then murdered by the lovely (and awfully skinny) Ms. Mead. (no Miss or Mrs. in this cast, it would seem), presumably so she could become a purple. Watch for Joan Collins to continue eating her Stu with relish even after it’s clear what/who it is. Watch too for Dinah Stevens to reason that it can’t possibly be Stu in the stew, since he was contaminated. Except he wasn’t. He was set up. How hungry would you have to be before eating an actual person—post-crash soccer teams notwithstanding. Before the end of The End, we’re thrown a curve or two. Ms. Mead and Ms. Venable aren’t telling everyone the whole truth. They’re making up their own rules and terrorizing the guests. They sneak around, and are probably hoarding resources. They’re also clearly sadists, and for a second there, it looked like they might kiss. We learned that Timothy and Emily are getting attached to each other. They’re sharing one kiss a week. 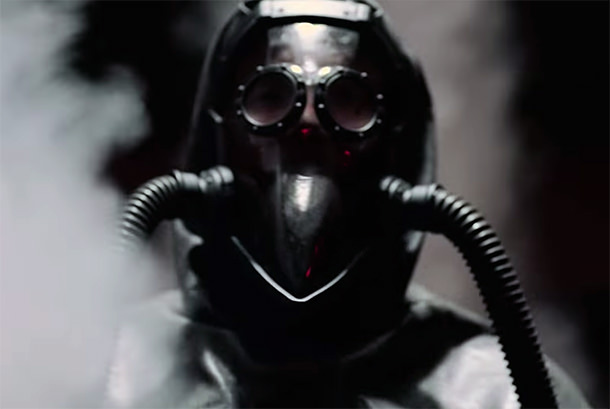 Finally, in the final segment of the evening, Michael Langdon shows up in a plague-style gas mask. If you don’t recall, he’s the demonic baby from Murder House. Um, the one that lives and was raised by Constance Langdon (Jessica Lange) from next door. Ms. Lange is returning this season as Constance, and will also be directing an episode. That’s gonna be sweet! Langdon is the undisputed king of The Cooperative, which might just turn out to be a pack of Laveyan Satanists. They certainly not Satanic Temple, because the folks in Outpost Three seem to have some sort of supernatural belief. 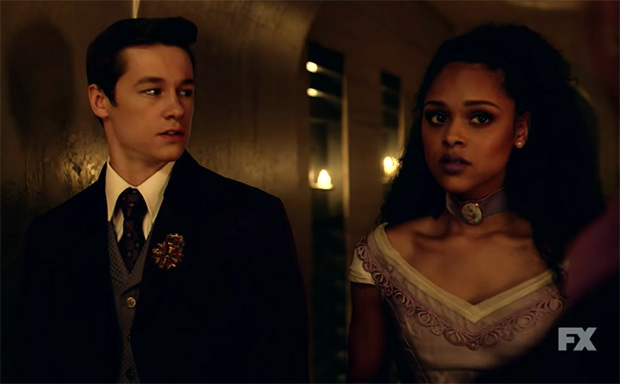 Langdon doesn’t know anything about Venable. As the episode draws to a close, we learn that Outpost Three is one of an ever-decreasing number of viable outposts. Langdon has popped by to evaluate the survivors to determine who is worthy to be taken to a new Outpost with more supplies. Outpost Three is running low. –How did Coco and her group reach the Outpost when there were no pilots on the plane? –Why does Michael Langdon look like a Vampire? –Does decontamination really hurt like that? –Who gave Timothy the “beware” warning with the 666? –Who or what took Langdon’s horses? –Did Kathy Bates lose like, a bunch of weight? –Who is in the Cooperative? What do they have planned? –Are there really canker pus monsters? The trailer did look like there might be zombies of a sort. –When are we gonna see The Murder House? So far, so good on this new season. We can’t expect a bombshell (pun intended) first episode, just because we don’t know these new characters well enough for them to shock us. I expect big things this season, as I imagine most of us do. What are you hoping to see in the next ten episodes? American Horror Story fans are elated to finally get a mashup of Murder House and Coven. Not much to indicate that just yet…well, except that one thing. This week we saw panic, a bunch of murders, kidnapping, decontamination, and Billy Eichner getting left behind. I bet that's not the last we see of that dude.